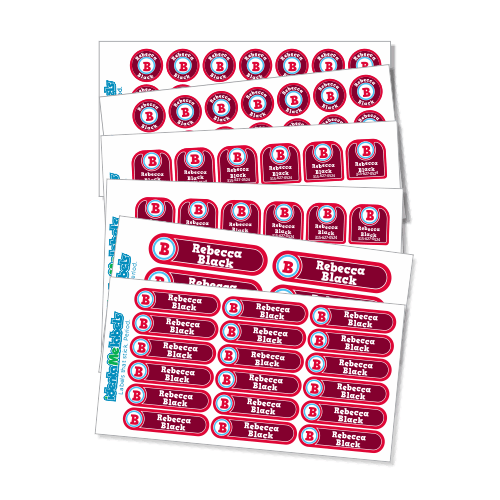 Our stick on labels camp pack has you covered! 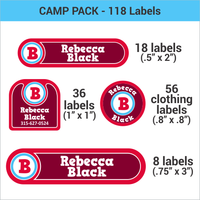 Our camp labels pack is definitely the easiest way to get your kids ready for camp. Label everything that's going to camp. 56 - Laundry safe labels for camp. 62 - Waterproof labels, (NOT for clothing). Save 17% vs. buying the same labels separately! 56 Small Round Clothing Labels 0.8" x 0.8"
36 Small Square Labels 1.0" x 1.0"
18 Small Rectangle Labels 2.0" x 0.5"
8 Medium Rectangle Labels 3.0" x 0.75"
Our Camp Label Packs have all the labels you need to ensuring all your kid's things will make it home at the end of camp. 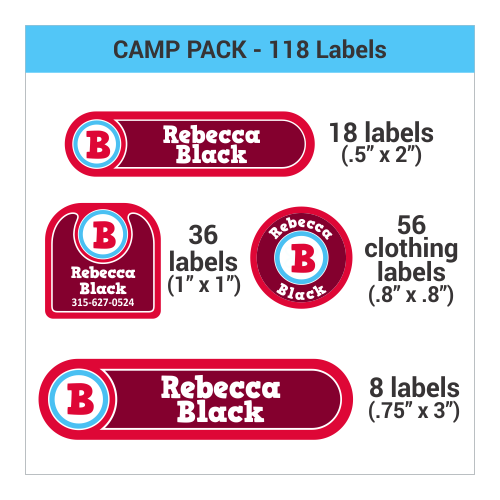 This pack includes 84 clothing labels for camp and 62 waterproof labels (not for clothing) that can be used on hard surfaces. So you can label absolutely everything that you're packing for them to take. Make sure to label backpacks, waterbottles, clothing, swim attire, footwear, sports equipment, electronics, flashlights, sleeping bags, toiletries - the list of items to label for camp is endless! 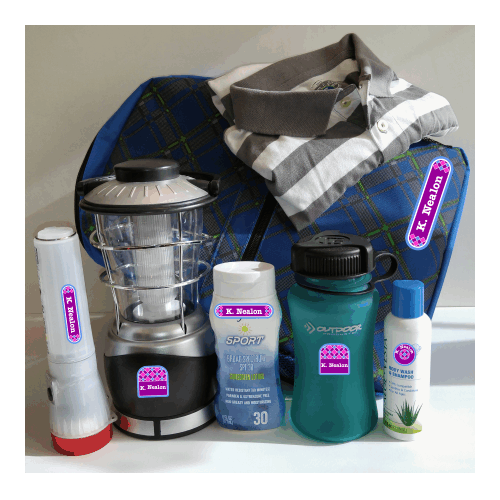 Our camp pack has all the labels you need to ensuring all your kid's things will make it home at the end of camp. 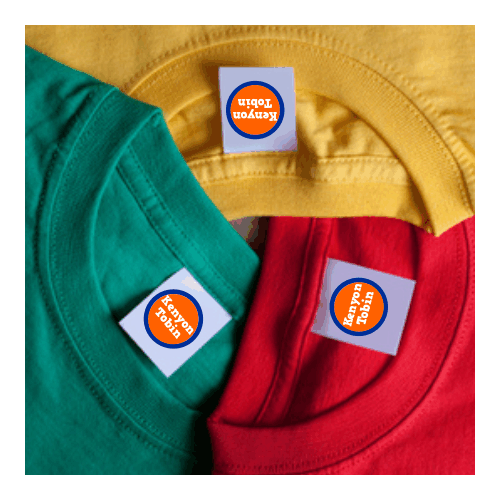 Our peel and stick labels are backed with an industrial strength adhesive so they'll stay stuck where you put themThe 56 small round camp clothing labels are unlaminated so they'll stay stuck longer and the other 62 labels are laminated so they're waterproof and safe to use on just about anything (NOT for clothing). Make sure that everything that you label for camp, comes home from camp. 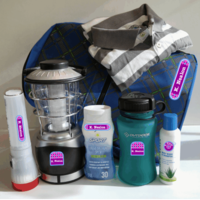 Personalize a camp pack today! You might also find our Small Round Label Multi-Pack handy for camp! Keep in mind how important Medical Alert Stickers can be when going to camp as well- be sure to check out our collection. 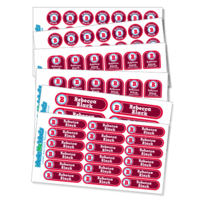 Product Safety Information Camp Labels Pack SHOULD BE APPLIED BY AN ADULT or WITH ADULT SUPERVISION. All of our labels are made with non-toxic materials and eco-solvent inks. Our labels are super sticky and durable but they're not truly permanent. They're made to come off with intent. Continued picking or chewing can make a label come loose from clothing and other materials. Keep an eye on the labeled items if they're going to be used by young children to make sure that they stay intact and are not accidently ingested. be especially careful when labels are used on teething rings, pacifiers, blankets etc. Our Camp Label Pack has both, laundry and dishwasher safe labels. 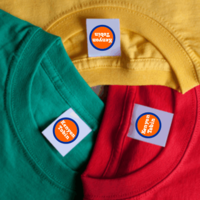 Stick your labels to the garment's care tag or directly to the brand stamp. Your Camp Labels Pack will ship using USPS First Class mail unless you choose one of our faster options when you checkout. The faster options are USPS Priority USPS Express, and FedEx Three Day. We can also ship your labels using UPS or other FedEx options - just give us a call and we can work out the details and the cost with you. If you'd like to provide us with your UPS / FedEx account number, we'll have your account billed directly.